Save the date! Our December WiN meeting will be held Thursday, December 1st. This is our annual Christmas Tradeshow & Social. 1. All members have the opportunity to have a vendor table to display their products and services. The cost is $10 which will be donated to The Christmas Stocking Fund. You must supply your own table. Please let me know ASAP if you would like to participate. 2. All guests can attend at the member price of $15+HST. Please share and invite those you think may like to attend. 3. There will be lunch, networking and of course opportunities to learn more about your fellow WiN members and guests, and do a bit of Christmas Shopping. This is always our best attended WiN meeting and I look forward to celebrating the holidays with all of you! Our November WiN meeting will be held on Thursday, November 3rd. Alyssa Huntly of eleven:eleven Full Circle Healing will be our guest speaker. Full details below. Please let me know by phone or email if you are planning to attend. I look forward to seeing all of you soon! Hello! Our October WiN meeting will be held Thursday, October 6, 2016. Jane Warr (Trainer Jane), Communications & Business Coach, will be our guest speaker. Full details below. If you are interested in attending please email: joinus@womeninnetworking.ca or call 705-786-1550. I look forward to seeing everyone! Join us Thursday, September 1st for an interactive presentation discussing STRESS and its impact on the Nervous System. 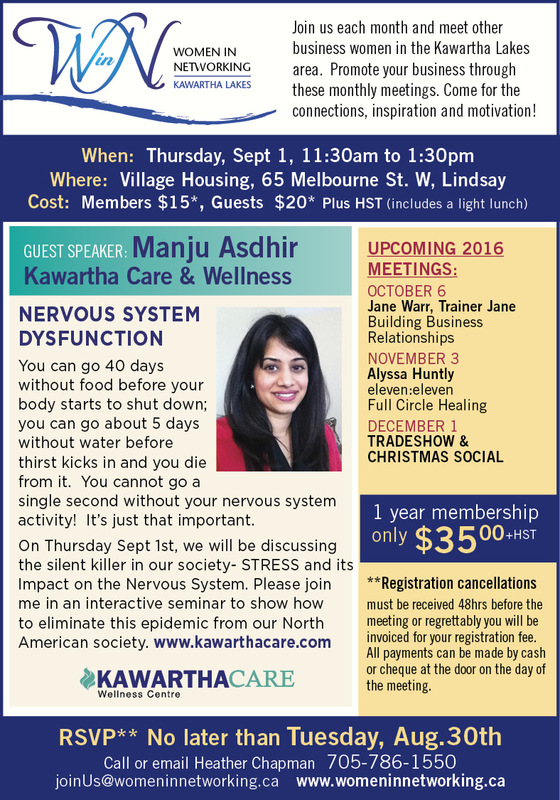 Manju Asdhir of Kawartha Care Wellness Centre will be our guest speaker. Full details below. Please let me know by phone or email if you will be attending. Yes, summer is here! But, business does not stop because the weather is warm and we are lured out onto the patio. It’s time to get your dose of business focus and motivation! 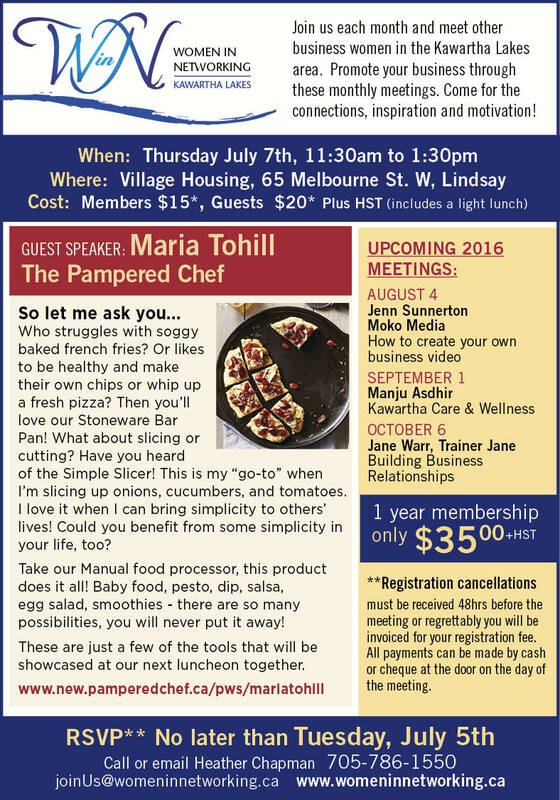 Maria Tohill, our lovely pampered chef will be presenting at our next meeting. She will be serving up some great pampered chef product ideas to help save us time and cook healthier in the kitchen! There is no obligation to make a purchase but for those who do, a portion of sales will help to fundraise for Kawartha Lakes Food Source. Full details below. Please let me know (via email) if you are planning to attend. Guests are always welcome! Enjoy the sunshine and I look forward to seeing everyone! Our June WiN meeting is Thursday, June 2nd. 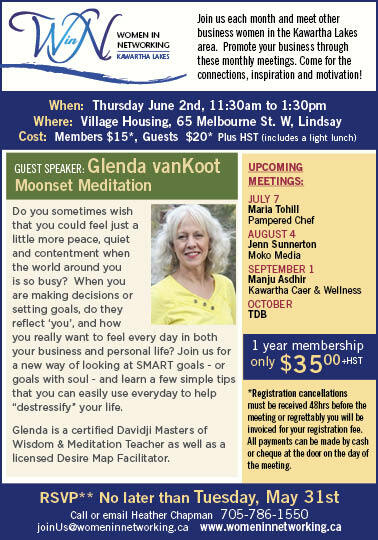 Glenda vanKoot of Moonset Meditation will talking to us about setting “Smart Goals” to reduce stress and bring more peace into our lives! Can’t wait!! Please let me know if you will be attending by emailing joinus@womeninnetworking.ca. Our May WiN meeting will be taking place Thursday, May 5th. Our guest speaker is Janet Ries, The Money Counsellor and I know she will have some great tips and insights for everyone! Full details below. If you are interested in attending please reply via email to "joinus@womeninnetworking.ca or by calling 705-786-1550. I want to thank you all for a wonderful meeting today! It was amazing how we all learned a bit more about one another today. How connected we really are through that common thread known as grief and loss. Thank you Nancy for giving us a much better understanding of the grieving process and an opportunity to talk about it. We laughed, we cried, we shared and I once again headed home feeling very blessed that we have the opportunity to come together each month. Janet Ries, The Money Councellor, will be our guest speaker next month (Thursday, May 5th) so be sure to save the date. I had the pleasure of working with Janet and have since learned a lot about myself and my business… financial clarity... a wonderful gift! Don’t miss it! Thank you Glenda, once again for helping me with registration and thank you Michelle for your help tidying up! It's going to be a great meeting this month! 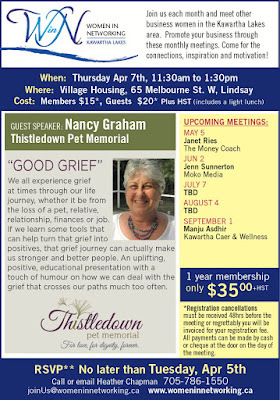 Nancy Graham of Thistledown Pet Memorial will be our guest speaker. Full details below. Please RSVP by email of you are planning to attend. I look forward to seeing all of you on Thursday, April 7th! 6. Linda J. Howes - Shining Waters Soap Co.
Hell Ladies and Happy New Year! So hard to believe February is just around the corner!! Which means, our February WiN meeting is coming up on Thursday, Feb 4th. 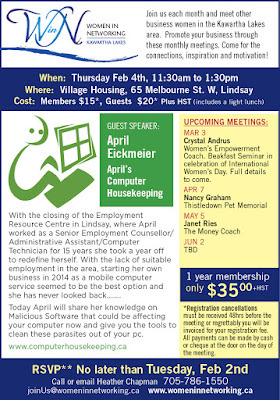 Our speaker is April Eickmeier of April’s Computer Housekeeping. She will be sharing her knowledge on malicious software that can affect your computer, your files and your time! Full details below. Please let me know by email (joinus@womeninnetworking.ca) if you are planning to attend and pass this information along to a friend or colleague who might be interested in attending.